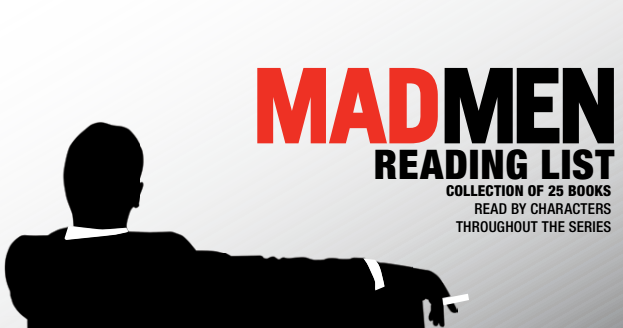 The good people over at the New York Public Library compiled a list of books read by the characters of Mad Men, which just started the last half of its seventh and final season. Over the course of the series, the show’s characters drank several swimming pools worth of cocktails, engaged in a host of ill-advised illicit affairs and, on occasion, dreamed up a brilliant advertising campaign or two. As it turns out, they also read quite a bit. All the books seem to say something about the inner life of each character. The show’s enigmatic main character, Don Draper, favored works like Dante’s Inferno and William Faulkner’s The Sound and the Fury – books that point towards Draper’s series-long downward spiral. The whiny, insecure Pete Campbell read Thomas Pynchon’s paranoid classic The Crying of Lot 49. And Bert Cooper, the aristocratic bow-tie sporting patriarch of Sterling Cooper is apparently an Ayn Rand fan; he’s seen reading Atlas Shrugged early in the series. You can see the full reading list below or here in a beautiful PDF designed by the NYPL. A number of the texts listed below also appear in our Free eBooks and Free AudioBooks collections. You forgot Ship Of Fools by Katherine Anne Porter, which Betty can be seen reading, and The Man In The Gray Flannel Suit by Sloan Wilson, which is read by Don. And since this article came out before the series ended, it’s missing three more of Don’s picks: The Godfather by Mario Puzo, The Andromeda Strain by Michael Crichton, and Hawaii by James A. Michener.